There was a prophecy that there would be a Jedi who would bring balance to the force. When Qui-Gon Jinn was on the planet of Tatooine he felt that this Jedi could very well be the pod racer Anakin Skywalker. He took it upon himself to train him in the ways of the force. But when he fell at the battle of Naboo that task became Obi-Wan Kenobi's. Obi-Wan and Anakin would become great partners during the Clone Wars but was Ani really the chosen one? 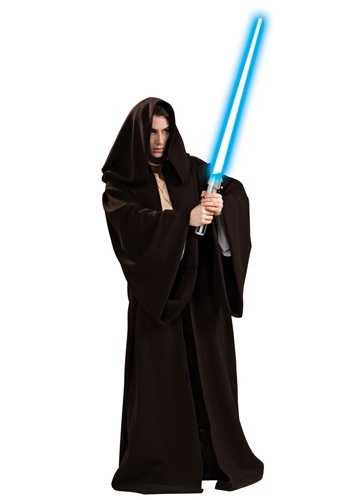 Now you can become the Jedi warrior that will one day be Darth Vader in this great Star Wars costume. Being a Jedi isn't just about swinging a lightsaber around and fighting Sith. It's also about wearing a sweet robe and walking around shrouded in mystery. 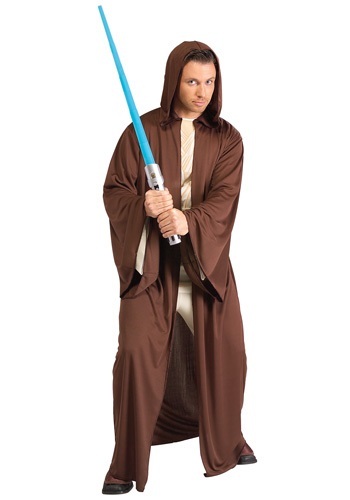 Flailing around the flashlight in the garage while wearing a pair of khakis and your favorite hoodie might seem like a good idea, but why settle for that when you could be practicing real Jedi moves in a real Jedi outfit? At least this way when the video of it ends up on the internet, at least you'll look authentic. When you live in the middle of Tatooine, there isn't much to do. You can get attacked at Mos Eisley Cantina, check moisture vaporators or bullseye womp rats in a T-16 Skyhopper. If you got some real courage, you can hit up Ben Kenobi and make him teach you how to fight the Galactic Empire as a Jedi Knight. Just make sure you dress for the Tatooine weather, which comes in 3 varieties: hot, searing and scalding. When little Anakin Skywalker was podracing around the deserts of Tatooine he never could imagine that one day he would become a Jedi in training. Then one day he was rescued from his slave life by Jedi Qui Gon Jinn and brought to the Jedi Temple to learn the ways of the force. 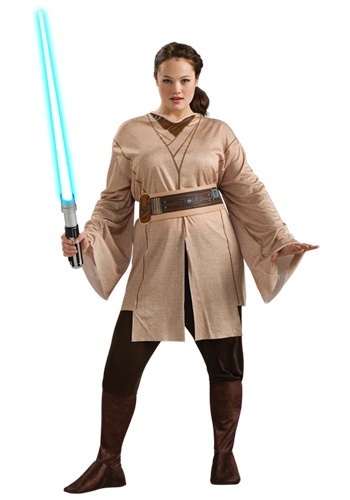 Now your little one will have a chance to look just like the newest Jedi in training with this Star Wars costume. Before he was the feared Darth Vader, leader of the Empire, Anakin Skywalker fought in the Clone Wars. Along side his fellow Jedi master Obi Wan Kenobi, Anakin would take on the evil Separatist armies to fight for the rights of the Republic. But not only would this Jedi fight bad guys but he would also take time to train his apprentice Ahsoka Tano and make sure she knows the ways of the force. 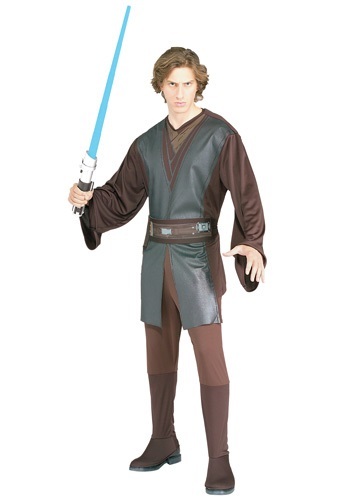 Now your child can look just like Anakin from the great Star Wars The Clone Wars TV show with this kids costume. One of the wisest Jedi's of the order is Qui Gon Jinn. This master always has a keen eye for all things related to the force. He is so good at seeing the force in people that he spotted Anakin Skywalker's ability in just moments. 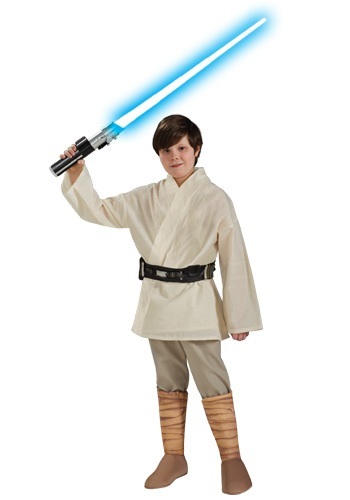 Now your little guy can become a Jedi hero in this official Star Wars costume. 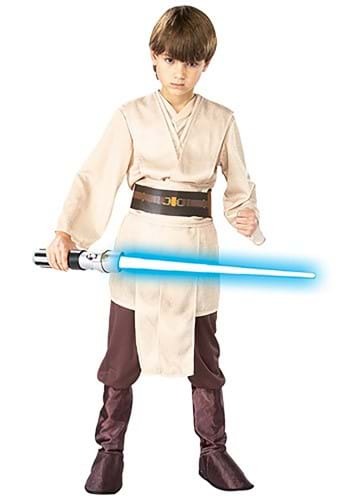 Is your child ready to start their Jedi training? They will be once you get them the proper gear. 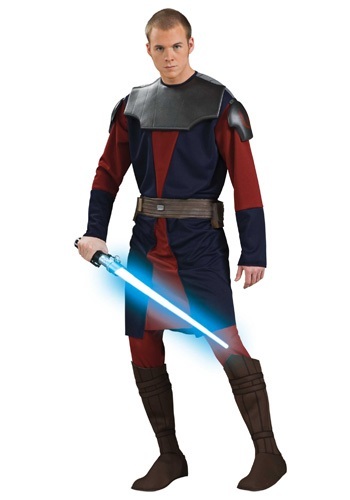 Near the top of the list of things to have before one enters the Jedi Temple for training is the correct robe. 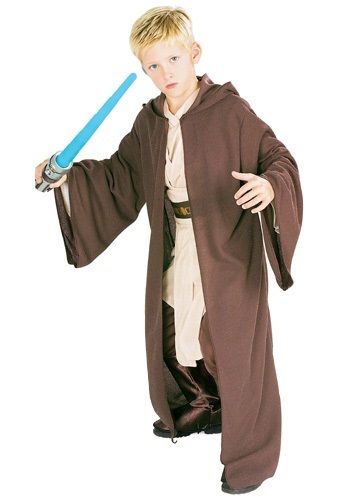 This robe will be with a Jedi on every adventure because it will allow them to keep warm on ice planets and blend into the shadows while on stealth missions. 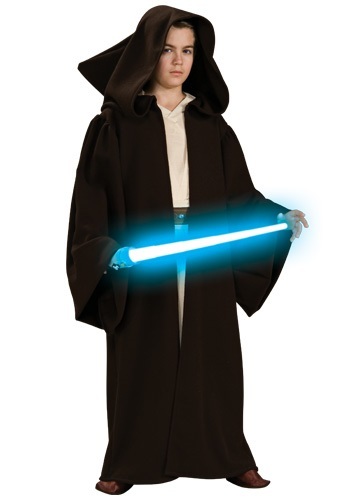 So when your little one asks to be a Jedi be sure to pick up this robe and one of our great lightsabers to get them started. The Jedi have always been a peaceful people. Using their knowledge of the force to help those around them keep a peaceful way of life. But when danger and evil some times shows up these peaceful people will become warriors in seconds. Now you can become one of these zen warriors in this Star Wars robe. Just be sure to pick up a lightsaber as well. "I am a Jedi, like my father before me. "When Luke Skywalker was growing up on Tatooine he dreamed of adventure off in far off places. Little did Luke know that his dreams were about to come true when he met R2 D2 and C-3PO and he would be off to save a princess and destroy an empire. Along the way he would learn that he is a Jedi and a great pilot. 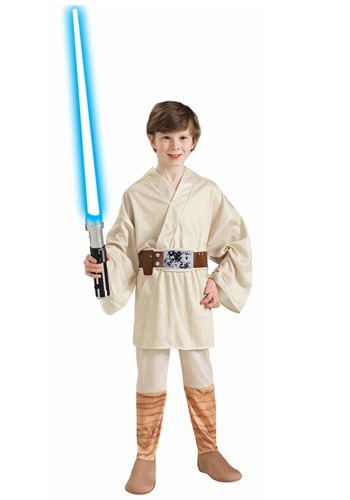 Now your little guy can pretend young Skywalker in this great Star Wars costume. Did you know that Obi-Wan and Anakin actually wore hair extensions in the movie because real braids take too long to grow? 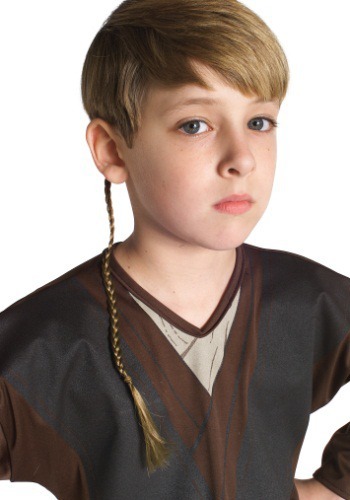 Get a quick Padawan braid with this Deluxe Jedi Braid. And may the Force be with you. Now you can become a member of the greatest order in the galaxy as one of the Jedi. These intergalactic peacekeepers make sure that the dark sides of the force don't take over the universe. To do this these knights have to learn how to hone their force skills with training starting from a young age. As younglings these Jedi in training have to practice lifting things with their minds and how to wield a lightsaber. Once they get to the right age they become an apprentice to a skilled warrior of the Jedi order. Then after they have proven themselves to have the knowledge to protect the universe they can go out and save the galaxy. Now you can join the side of good as a knight of the Jedi order! 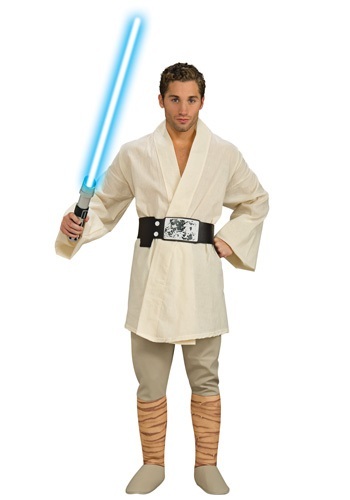 Make your Jedi costume stand out with this Jedi Robe! 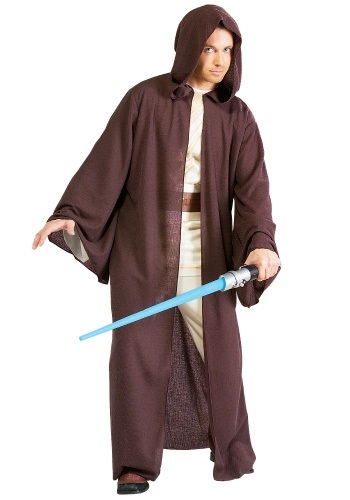 The brown polyester robe replicates those worn by the Jedi in the Star Wars films. 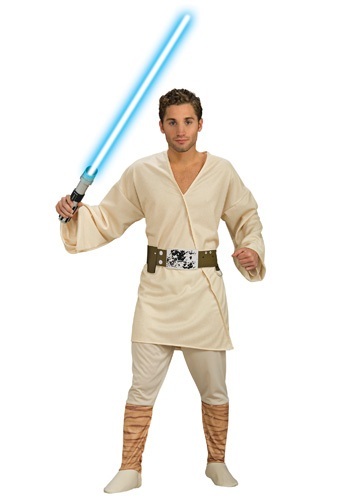 Remember to add a lightsaber to complete the look of this officially licensed costume. The Clone Wars had epic battles that pitted the galactic republic against the separatist armies. One of the Jedi that took part in these battles was Anakin Skywalker. He fought along side Obi-Wan Kenobi to defend the freedoms of the planets they protected. 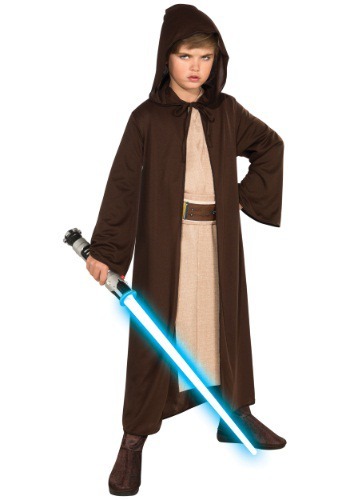 Now your little one can dress like their favorite Jedi in this Star Wars costume. Anakin Skywalker started out as young podracer and then would go on to be the most feared man in the galaxy as Darth Vader. But between those events he was a Jedi in training following his master Obi-Wan Kenobi's rules. These two Jedi would also make names for themselves fighting in the Clone Wars. 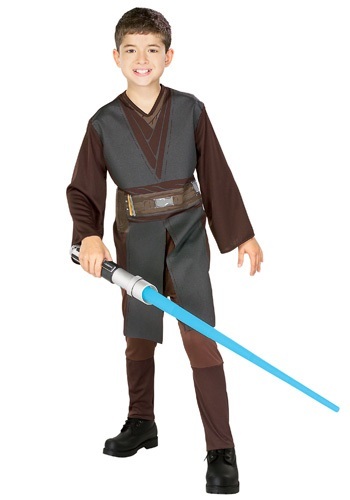 Now your little one can look like one of the greatest Jedi's ever in this Star Wars costume. On the planet of Coruscant is the Jedi Temple where young Jedi learn how to use their force powers for good. These younglings learn how to use a lightsaber and how to move things around a room with their force powers. They also learn how to trick simple minds by waving their hand. Now your little one can join the ranks of great Jedis in this Star Wars robe. If you're in need of a hero in the far off parts of the galaxy you have to call upon the Jedi order. These warriors are trained in the ways of the force and make sure that good will always come out on top. 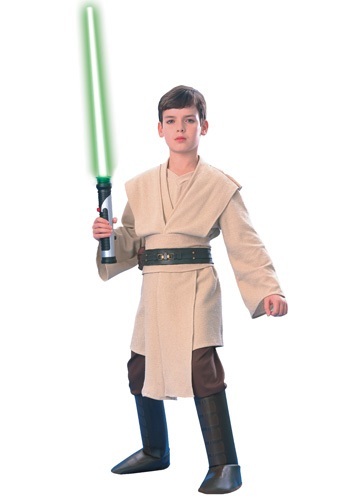 Now your child can join the likes of Obi-Wan Kenobi and Luke Skywalker in this great Star Wars robe! "I'm Luke Skywalker, I'm here to rescue you! "No one could have guessed that a young moisture farmer would go off one day to save the galaxy. That's right, little Luke Skywalker would one day learned that he was destined to become a Jedi who would bring balance to the force. 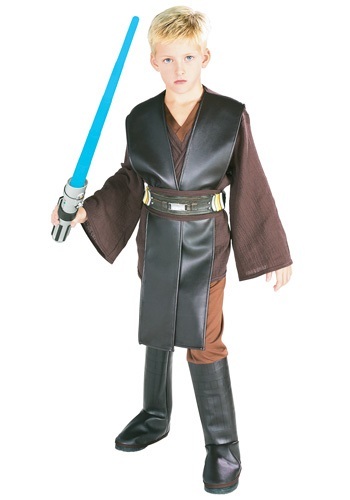 Now your little one can look just like the hero from Tatooine in this great Star Wars costume. You COULD spend your whole life on a moisture farm on Tatooine, or you could start your training to become a Jedi Knight? It all boils down to whether or not you want to get a cool lightsaber, fight Darth Vader (who's actually your real father), and blow up the Death Star. That sounds way better than checking vaporators all day long in the hot sun. "I'm not testing you... Life tests you! Every day it brings you new chances for triumph or defeat. And if you pass the test, it doesn't make you a Jedi. It makes you human." You're human...more importantly, you're a Jedi, one of the Galaxy's greatest warriors. 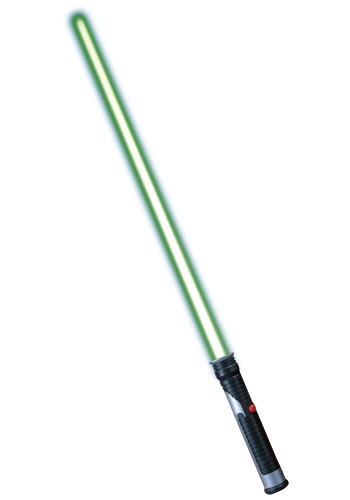 Guard the universe with a Qui-Gon Jinn Lightsaber Accessory! Being force sensitive has its perks. You get to play with lightsabers, you can lift spaceships out of swamps with your mind and you can have a cool master like Yoda. The only catch is that you have use your powers for the good of the galaxy and not use them for selfish reasons, like using the Jedi mind trick to mess with your roommate. 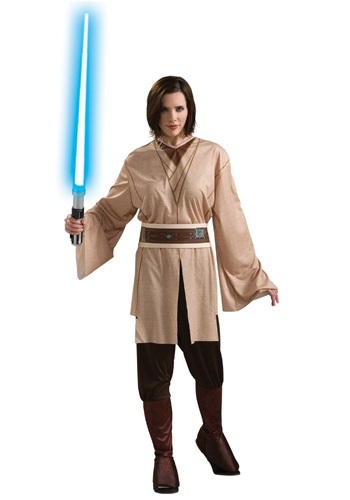 Either way, you need Jedi gear, like the stuff included with this set, to look like a real one.